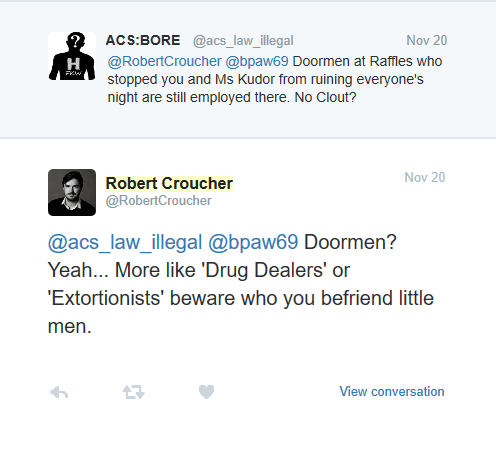 Copyright Troll Robert Croucher ditches companies? | Received a letter from Goldeneye International? MICM(Mircom? TCYK LLC? This entry was posted in Hatton & Berkeley, maverickeye and tagged brigitta kudor, copyright, copyright trolls, douglas miller, Hatton & Berkeley, maverick eye, patrick achache, raffles, robert croucher. Bookmark the permalink. 1 Response to Copyright Troll Robert Croucher ditches companies? Delighted Crouched was imprisoned. A vile slug. I received his threatening letters re torrents etc. I would give up my house to get in a boxing ring with that slimy fraud.